One of the most interesting of all of the native wattles is Acacia aphylla, it has the trademark yellow flowers we find on many wattle trees, however is strikingly different in growth habit. Commonly called the ‘Leafless Rock Wattle’, it is found around Perth. This is a spiny, spiky looking plant however it is actually soft to touch. Grown as an architectural or foliage plant it could be more widely used in landscaping where it has year round interest. 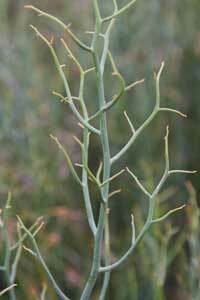 This is actually a succulent and is adapted to extremely harsh conditions. The term ‘aphylla’ actually means with no leaves and it is a beautiful wattle when in flower. Prune hard every 2-3 years or Acacia aphylla will start to look a little leggy. Requires excellent drainage, yellow flower like little yellow balls cover this fascinating plant in spring. These plants can be pruned after flowering and pruning can be harsh, to around 30cm from the ground. Regrowth will commence in a month or two and in 8 months the new foliage will be an attraction in the garden. Usually propagated from seed, the seed is scarified by using boiling water and then left to soak. Germination rates are good however young plants are subject to ‘damping off’ so a good draining propagation mix is essential. On germination. the plant will produce juvenile leaves, these will soon disappear and the modified structure will take over. Common Names – Leafless Rock Wattle, Leafless Wattle, Twisted Wattle and Live Wire. Height – Will reach around 3 metres in height. Foliage – No foliage as we know it, the foliage is actually modified to appear as stems. Drought tolerance – Very drought tolerant.